Good evening Eagles fans! Even though it is only April, spring football is just around the corner and, once spring ball starts, we know it is not much longer until we get to see our Eagles take the field again! While last season did not end the way we had hoped, there is always hope for the future. Over the last five seasons, Rhea County has experienced consistent success. Each season, the Eagles have made the playoffs and either captured the region championship or came in second in the race. The Eagles went undefeated in region play three times, capturing the District 6 title in ‘13 and ‘14 and the Region 4-5A title in 2016, and came in second in 2015 (Ooltewah) and 2017 (Knoxville Catholic) in Region 4-5A. With a retooled schedule, the Eagles look to continue their winning ways this season. Blackman High School, that defeated Rhea County at Eagle Stadium in the second week of the 2017 season, requested out of playing a second game in Murfreesboro. In their place, the Eagles will play the Brainerd Panthers on August 24 in Evensville. The Eagles have a lot to build off of from the tough schedule they played last season, and, even with the loss of Blackman from the docket, this season looks to be almost as formidable as 2017. This season’s schedule features four 6A teams in Cleveland, McMinn County, Bradley Central, and Cane Ridge. Only one, McMinn County, did not make the playoffs. Bradley Central made it to the quarterfinals, and Cane Ridge finished the season as the runner-up in the 6A state title. Of the other teams, including region opponents, they all made the playoffs with one, Knoxville Catholic, winning the 5A state title. 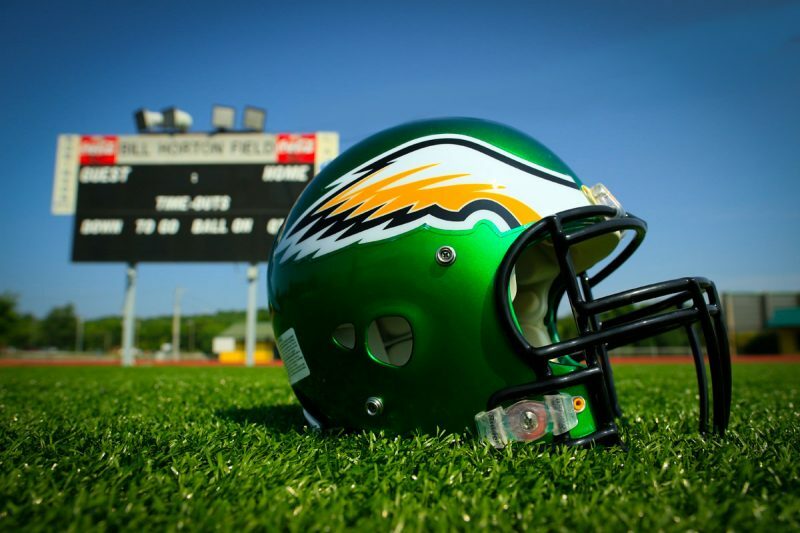 The 2018 season will be no easy task for the Eagles, but, with the right grit and determination, I believe Rhea County can be successful again. With Zach Pemberton returning after two seasons as the starting quarterback for the Eagles, as well as Region 4-5A Defensive Player of the Year Chandler Kaylor, Region 4-5A Defensive Back of the Year Aulbrey Smith, and many others on top of a stellar group of freshmen joining in the summer, we could be in for something special this year with the Eagles. The weight room is already clanging and cranking this spring as the players get their bodies ready to handle the intensity of spring ball and the heat of summer workouts and practices in the coming months, and spring practices are just a few weeks away. Sit tight, Eagle Nation! Football is just around the corner!